In the wake of Argentina being blocked from making debt payments, there is much speculation about who lies behind various trades taking place in financial markets. Argentina has been declared to be in default by the banks which run the International Swaps and Derivatives Association. 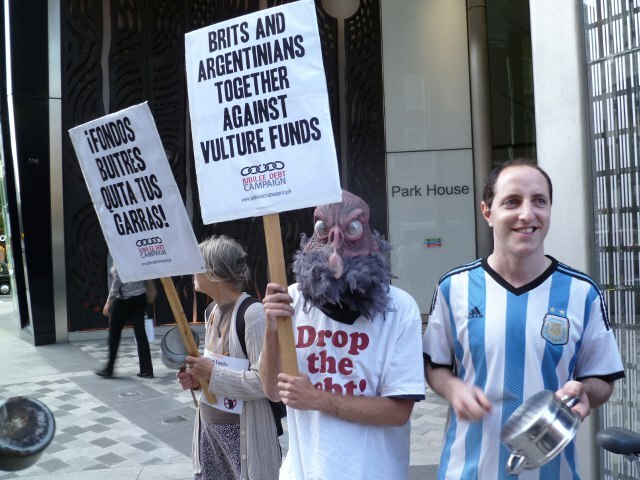 The move comes after vulture funds NML Capital and Aurelius Capital Management got US Judge Griesa to declare that either they get paid in full, or Argentina is not allowed to pay its bondholders who accepted a reduction in the amount of debt owed in 2005 following the country’s debt crisis. Since 30 June, American banks have been refusing to process Argentina’s payments – which it has continued to make – on various interest amounts coming due. 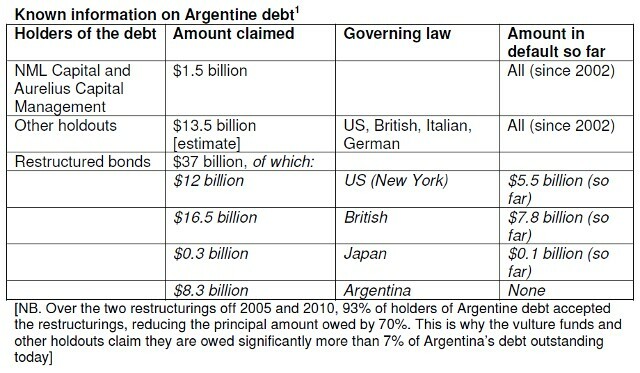 Initially this included not only debts owed under US law, but also those under Argentine, British and Japanese law. The Argentine law bonds have now started to be paid again, but payments on the British and Japanese law bonds continue to be blocked. In fact, more is owed under the British law bonds ($16.5 billion) than the US ones ($12 billion). The declaration of default triggers payments on Credit Default Swaps taken out against Argentine debt – bets that the debts would not be paid in full. The amount paid out on these swaps will be decided in an auction taking place on Thursday 21 August. The more likely Argentina is judged by financial markets to be allowed to pay the debts eventually, the less will be paid out on the swaps. There has been speculation that the two vulture funds themselves own significant amounts of Credit Default Swaps. If true, this would mean they stand to profit significantly from the ‘default’ they have forced on the South American country. What is definitely true is that in the murky world of government debts and Credit Default Swaps, no one can know for sure who is owed and owes what. There had been talk of various multinational banks buying the bonds held by the two vulture funds, and then reaching a deal with Argentina. This has been denied by Aurelius, who in a rare public statement said there is “no realistic prospect” of such a deal being reached. The holders of the restructured bonds which are being blocked from receiving their payments now have the legal ‘right’ to demand that Argentina pay all interest and principal due in full – a clause in bond contracts following a default known as ‘acceleration’. If the restructured bondholders make this move, there is no way Argentina could pay, either financially, or physically because the payments would still be blocked by the US judge. To demand this ‘acceleration’ requires owning 25% of the value of a certain set of bonds. There has recently been a lot of trading in one set of bonds worth in total $95.3 million, which are due to be repaid in full in 2038. Owning just $24 million of these bonds (which would cost less than this to buy) would be enough to demand Argentina pay in full now debts which are not due to be paid for another 24 years. Could it be that vulture funds themselves are behind buying up these bonds? Again, the lack of transparency means we do not know, but it would give them another weapon in their unjust fight against the Argentine people. The Argentine government’s latest step has been to lodge a case at the International Court for Arbitration in The Hague against the United States, for breaching its sovereignty by blocking Argentina’s debt payments. Jubilee USA have noted that there are two other debt cases against governments in the New York Courts. Following Grenada’s default in March 2013, last year Taiwan sort to sue the Caribbean island. The case is currently on hold and negotiations are taking place between Grenada and Taiwan. There are also bondholders who Grenada is currently in negotiations with on a reduction in the amount owed. In the second, Des Moines Investments Limited and Themis Capital have won a judgement saying they are entitled to $70 million from the Democratic Republic of Congo. The debt originated with loans to the regime of General Mobutu in the 1980s. The two vulture funds are calling on the Congo to pay up, but if they continue to refuse to do so, the vultures will presumably start seeking ways to seek assets and force repayments. The Congo has not yet joined the ranks of African governments issuing bonds in recent years, so the same strategy as NML and Aurelius against Argentina may not be open to them, yet. The vultures cannot pursue Congo in the UK courts for this debt because of the law passed in 2010, and in Jersey, Guernsey and the Isle of Man thanks to the laws passed last year. What is clear is that for any government issuing new bonds, the last place you would want to do so it in New York and within reach of Judge Griesa.